Yep, this is gorgeous! Love your button-sun! Very pretty card!! Love that sunburst...I hope you'll join me again at 52 Card Pickup this week. Very elegant Easter card. Thanks for joining in our “embossing” challenge at Fab’n’Funky this week. Awesome! Love the chevrons embossed on the Kraft CS...so cool! Thanks for joining us at The Kraft Journal. your work is amazing, Lea! love your use of colors! Wow. Seriously, Lea this is amazing. I love everything about it, but especially the way you put the sun in the background. Gorgeous! New follower in me! Thanks for joining us in our Easter/Religious challenge this week at Paper Sundaes! Good luck! This is beautiful. I love the embossing. Thanks for joining us at The Kraft Journal. Congrats on being KJB top #3! 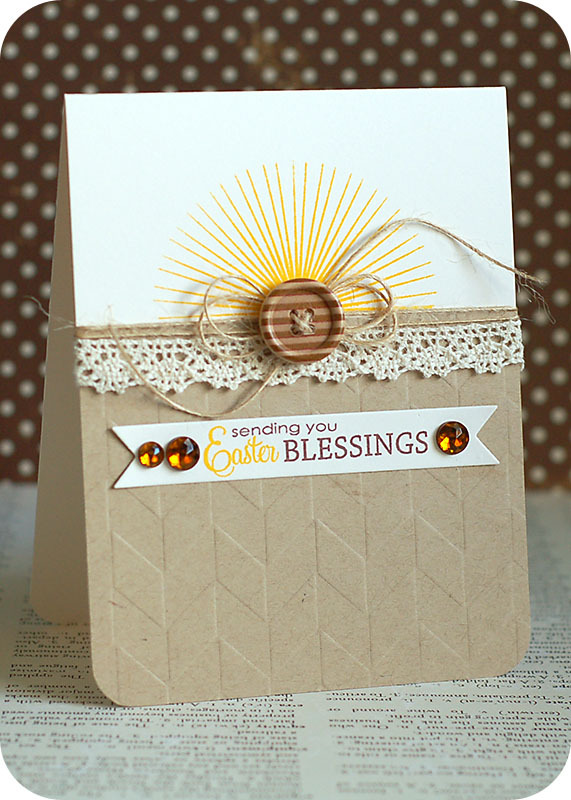 I SOOO like that chevron embossing die - also the sun placement, as if it's rising or setting! This is one of my favorite cards ever Lea! Just gorgeous.